Hey all you people! Meet some creative, passionate and fun people. 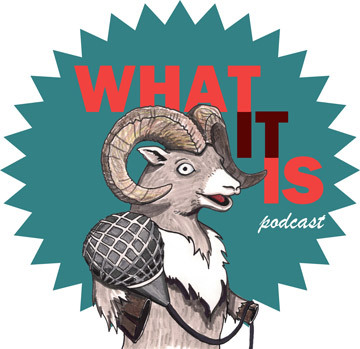 In this ep the guys from What It Is chat up Cas from Wares about the ferocity in her performances and the deep connection she makes with her fans. Plus, things get a little blue when Taylor stumbles into a dressing room to record with fan-favourite Trevor Schmidt and (soon to be fan-favourite) Arielle Rombough to discuss The Good Bride from Northern Light Theatre. Things get smart and silly all at the same time. How is that even possible? Find out by tossing this ep in your ear holes! We get into it with #yegtheatre bloggers (and vloggers) Louise, Jenna, Savanna and Kristen. The team discusses why they write about theatre without being paid, their favourite work of the 2014/2015 season AND they play an all-new game you won’t want to miss! Truths are exposed, names are dropped, bloggers get confused about what they wrote and Chris W. Cook lays out your arts news. Get it in your hearing holes!